and the calendar window will open. Note that the current day is highlighted yellow. 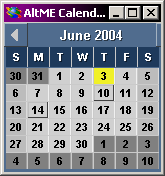 The calendar window can be resized to show as much or as little detail as desired. 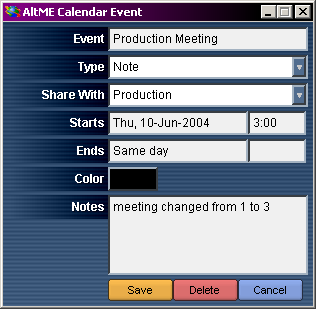 Depending upon the size of the calendar window, the days with scheduled events are bolded and the event color is displayed. 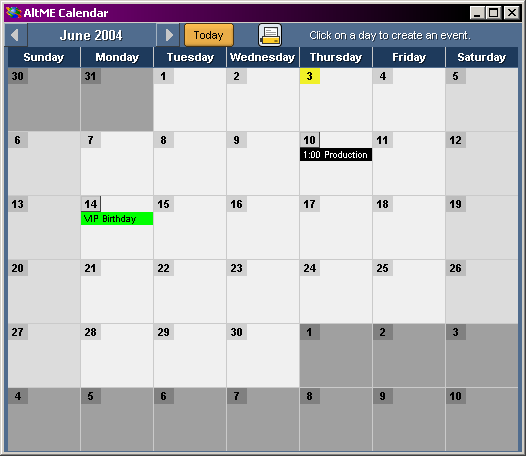 Calendar items are very simple to create and modify. As you make changes, like resceduling appointments, everyone you specify can see them. 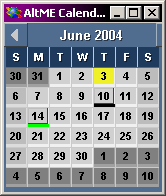 To add an event, click on the day and a calendar event box will open. 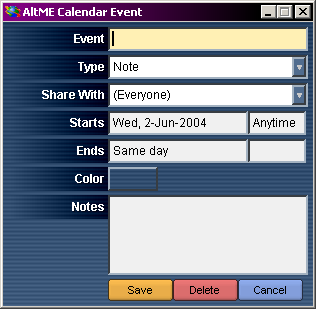 Enter the event discription, choose the type of event, the users that you want to share this event with, the start date defaults to the day you clicked on but may be changed, the time in the form HH:MM, the end date if the event spans more than one day, the color you want the event to display on the calendar, and any notes that you want to make about the event. You may edit events by clicking on them in the calendar. The event window will open and you may make what ever changes are needed. Note the change in the time for the production meeting. You may remove an event by clicking on it in the calendar and selecting the delete button at the bottom of the event box. To move from month to month, click on the arrows to the side of the month name in the upper left hand corner. This will create an html page which will open in your browser. Then select the Print option from your browser menus.